I used to LOVE eating canned peaches. The syrupy sweetness, the strange canned mealy texture, the convenience of those little snack cups – they were the perfect treat for my five-year-old self. I can’t remember the last time I ate canned peaches, but I’m thinking I should definitely go ahead and can some for a taste of sunshiny summer in the middle of winter. I haven’t gotten around to canning yet, but the abundance of peaches at the market are begging to be eaten. Peaches are delicious out of hand, but I love a good crumble. Crumbles are a fast and easy way to fancy up fruit. 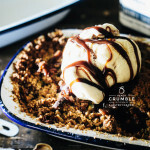 I used salted caramel to sweeten this crumble, but if you don’t have any salted caramel you can always use brown sugar. When I made this, I intended it to be a dessert for two, but I ended up eating it all by myself. After the first bite, I was hooked. The creamy, cool ice cream melting into the warm, cinnamon-y, soft, sweet peaches, the crunch of toasty pistachios, and the satisfying crumbs were a bit too addictive. I managed to let Mike have a bite or two, but let’s just tell it like it is: I demolished it and called it dinner. I collaborated with Pigment on this post! 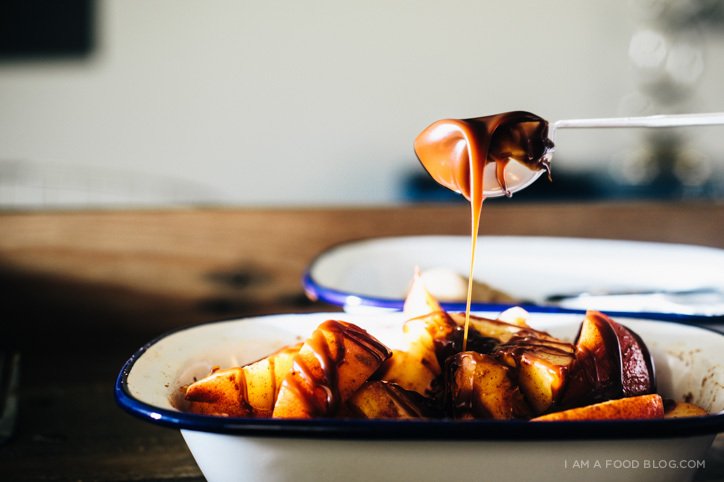 If you like the enamelware dishes, head on over and take a look! In a dry pan, toast the pistachios over medium heat, shaking pan occasionally, until toasty and delicious, about 4-6 minutes. Remove from the pan. If inclined, use a clean kitchen towel to rub off the skins, if not, let cool and then roughly chop. In a small bowl, toss the peaches with the caramel or sugar, cornstarch and cinnamon. Place peaches in a small ovenproof baking dish. In a bowl, whisk together the flour, sugar, cinnamon and salt. Use your fingertips to work the cold butter into the mix until it starts to clump up into crumbs. Add most of the chopped pistachios (setting aside about 1 1/2 tablespoons for topping). Evenly spread the crumb topping over the peaches. Bake the crumble for 30-35 minutes, until fruit is tender and bubbly and topping is firm and golden. Rest for 15 mins then enjoy with ice cream, reserved chopped pistachios and warmed caramel, if using! Can’t get enough peaches? Check out more peach recipes here, here, here and here! 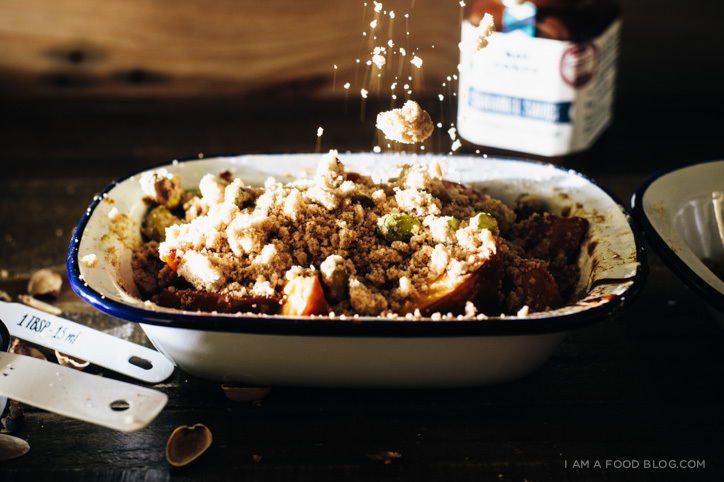 Plus the idea of using caramel makes this crumble mind-blowing))! This sounds divine! 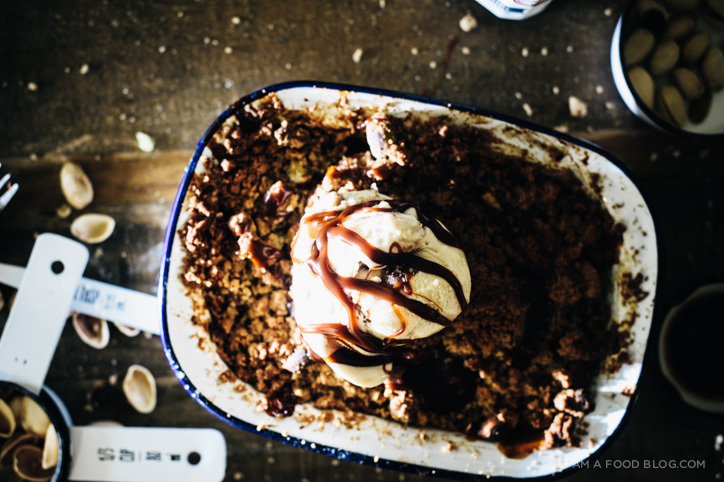 No shame in dessert for dinner – that’s totally a move I would pull too haha. Holy yum!! I love the pistachios in this! 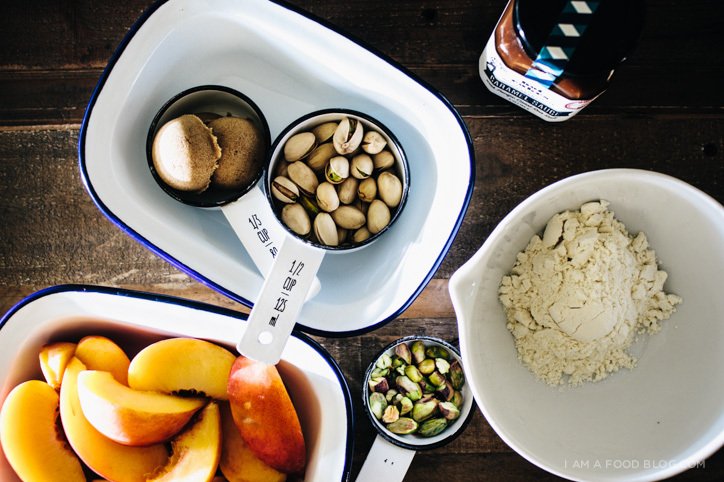 Peaches and pistachios – not just an awesome alliteration but a delicious duo! OK sorry, couldn’t resist, #wordnerd here. Jokes aside, this looks awesome and I particularly appreciate the smaller size! um, damn it! i finished all our peaches from the farmers market already. in two days. clearly i need more to make this now. I would make that dessert for one also!! Looks delicious!! Ooooh! 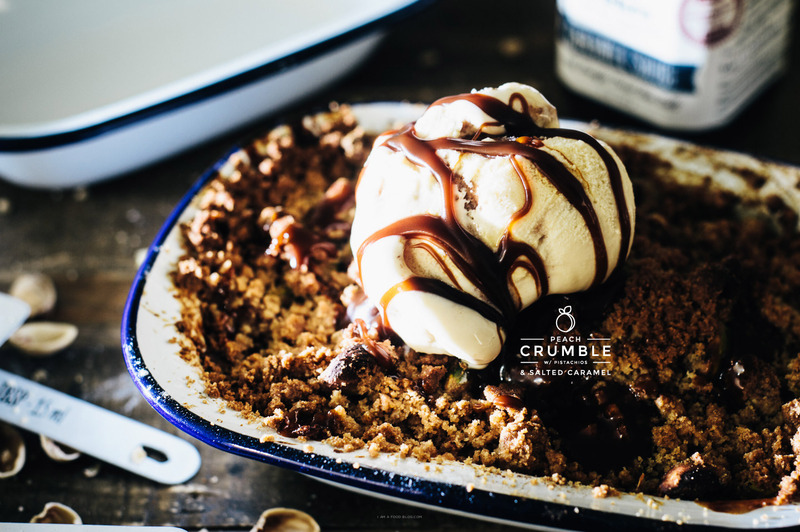 This crumble looks fabulous. 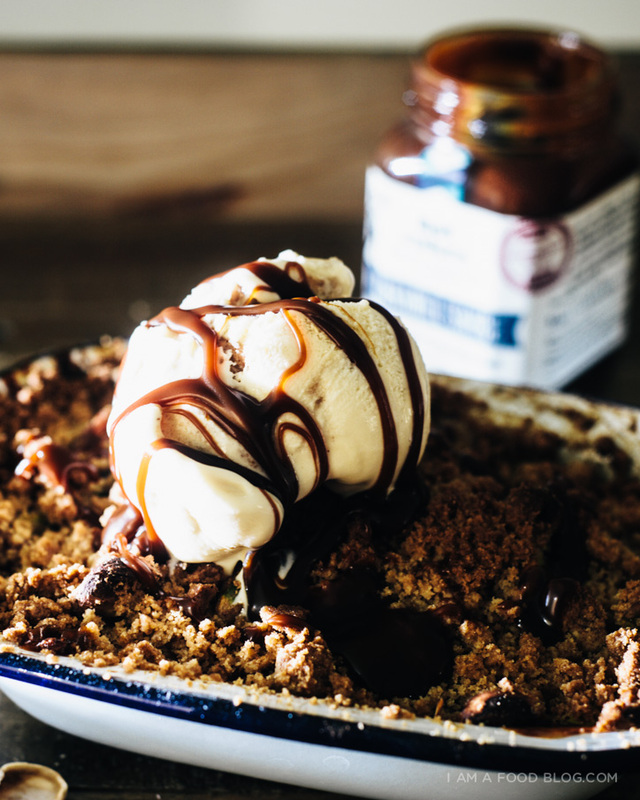 And that scoop of ice cream and salted caramel drizzled on top…swoon. A) I used to loooove canned peaches too! I was obsessed. I wonder if it is possible to make a healthier less intensely sugar-y homemade version. The photos are absolutely unreal. Case in point, I actually tried licking my screen. Dying over these photos! Looks so so good! I’m new to your blog and love the rustic style of your photography. This recipe looks so fancy. Don’t feel bad about eating the entire thing, I totally would too. Pinned and will have to try this out. I share the childhood memories of canned peach halves! Sometimes ours were from the store, but sometimes my mom canned them from roadside stand bushel-basket bonanzas — those were amazing. I love the idea of kicking up the crunch here with lots of pistachios! I am a big pistachio lover… your desert looks solo delicious! Have ever been in SEPTEMBERS PISTACHIO FESTIVAL in Aegina (island), Greece???? Good LORD this looks delicious!!! Your photos are pure magic!!! I just want to take that cliche bite through the screen. Canned peaches are totally my secret guilty fruit pleasure!! They’re so sugary it’s like is this really fruit?! Anyhoo, um I LOVE that enamalware so much!!! Yay for partnerships!! !